Imaginary monsters from the “Goosebumps” books of R.L. Stine come to life and terrorize a small town. Having accepted a position as the high school’s vice-principal, Gale Cooper and her teenage son Zach move from New York to Madison, Delaware. After greeting his aunt Lorraine, Zach meets his next-door neighbor Hannah and her strange father Stine while unloading boxes. At school, Zach makes friends with misfit student Champ. Zach meets Hannah again when he comes home and she takes him to an abandoned carnival in the woods. Thinking that Stine might be harming his daughter after hearing screams next door, Zach calls the police. However, Stine convinces officers Stevens and Brooks that Hannah went back to her mother’s in London and nothing is amiss in his home. Gale goes to chaperone the school dance, leaving Zach home alone with Lorraine. Zach has Champ help him break into Stine’s house to investigate the strange activity. The boys realize Hannah’s father is famous author R.L. Stine when they discover a bookcase full of locked “Goosebumps” manuscripts. Startled by Hannah entering the room, Zach and Champ drop the manuscript for “The Abominable Snowman of Pasadena” and it accidentally unlocks. A giant creature emerges from the pages and destroys the room. While escaping the house, the snow monster knocks over “Night of the Living Dummy” and it unlocks. Hannah, Zach, and Champ follow the yeti to the ice rink and try recapturing it with the book. When the monster overpowers the trio, Stine arrives to rescue the teens by sucking the monster back into the manuscript. Back at his home, Stine explains to the boys that since childhood, his imagination’s creations have become real entities that can only be contained within the pages of his stories. Stine goes to collect his manuscripts in preparation for leaving town, but discovers that Slappy the ventriloquist dummy is free. Slappy burns his manuscript and escapes the house with all of the other books, unlocking “Revenge of the Lawn Gnomes” on the way. Stine, Hannah, Zach, and Champ battle back the gnomes, but find Slappy burned that book too, preventing their recapture. Slappy continues unlocking books and unleashing chaos while driving across town. Townspeople including officers Stevens and Brooks end up frozen solid by aliens with ray guns. With the old books destroyed, Zach convinces Stine to write one new story containing all of his creations in order to collect all of the monsters. Stine insists that he needs his special Smith-Corona typewriter, which is on display inside the school. On their way to the high school, Stine and the three teens are attacked by an invisible boy, a giant praying mantis, and a werewolf in a grocery store. Lorraine stumbles upon the group and takes a romantic interest in Stine before Zach sends her to the police station for help. Passing through the cemetery on their way to the school, moonlight makes Hannah transparent. Zach realizes she is a creation from Stine’s imagination. Stine, Zach, Hannah, and Champ make it to the school and collect the typewriter. Stine goes off to write alone while the teens gather everyone at the dance to battle more attacking monsters. Champ rescues his classmate Taylor from a werewolf after her boyfriend Davidson abandons her. As monsters continue swarming the building, Slappy confronts Stine and prevents him from finishing the last two pages of his new book. After luring the creatures away from the school with a bomb aboard a school bus, Stine, Zach, Hannah, and Champ escape to the abandoned carnival to complete the book. Slappy follows and releases a monstrous blob. Stine gives Zach the pages and tells the teen to finish the book while he holds off the blob. Zach finally finishes the book atop the Ferris wheel, but is afraid to open it because Hannah will disappear along with the creatures. Hannah confesses that she already knows she is not real. She takes the book from Zach and opens it herself, creating a vortex that begins sucking in the monsters. Slappy confronts Stine one more time and Hannah says goodbye to Zach as the book closes with all of the imaginary creations inside. R.L. Stine’s original “Goosebumps” line debuted as I began my final year of high school and concluded after I graduated college. Being outside the target demo during its heyday means the series didn’t play a part in my horror upbringing like it did for younger fans raised in the 90s. That leaves me to come at the feature film adaptation with an eye of casual curiosity and no preexisting nostalgia for the “Goosebumps” brand. Knowing these broad strokes of what mainstream minds associate most with “Goosebumps” leads me to conclude that the movie hits every theme, note, and nuance that makes the name resonate no matter the viewer’s age or familiarity with the content. And Darren Lemke’s script from a treatment by Scott Alexander & Larry Karaszewski creates a clever way to work all of Stine’s key creature creations into one single story. Jack Black stars as a fictional incarnation of R.L. Stine. Black is in on the joke of how fatty his ham slab performance is, though that doesn’t exonerate the distractingly odd accent put into the part. Of course, it wouldn’t be a Jack Black role without at least one questionable characterization choice. It’s just curious that he opts to add more flourish to his human half than to his voice as the sentient ventriloquist dummy. Selling 400 million books worldwide doesn’t give Stine the type of luxury yacht life you might expect. The cost of having a mind mad enough to invent this many monsters is that his imagination is so incredible, his creations literally come to life. Stine has been able to keep the beasts locked inside magical manuscripts by writing a book for each one. But when his daughter Hannah takes an interest in new next-door neighbor Zach, the teens inadvertently open one of the terrible tomes. This sets off a chain reaction that sees the small town of Madison, Delaware engulfed in an invasion of mutants, mummies, crazed clowns, and furry freaks. “Goosebumps” has three levels to its comedy, and two of them work. Perhaps not an overwhelming majority, but the ratio evens itself out to keep the film good-humored more often than not. Falling flat are noodle-armed stabs at trendy laughs. Like the high school’s vice-principal erroneously assuming a twerking joke will endear her to teens, “Goosebumps” elicits cringing groans from references to YouTube or an oblivious aunt obsessed with bedazzling men’s clothes. These are the kinds of gags mistaken for topical or original that even kids roll their eyes at as overdone. Better snickers come from meta-humor winks, like Stine having written too many books to remember, or the author’s eternal grudge against being regarded as a poor man’s Stephen King. When the movie isn’t dating itself, situational humor shines, particularly in instances of an overzealous training officer confusing proper police procedure in adorably dangerous ways. Director Rob Letterman excels at staging actors so these funnier bits feel fresh even when certain scripting sounds stale. 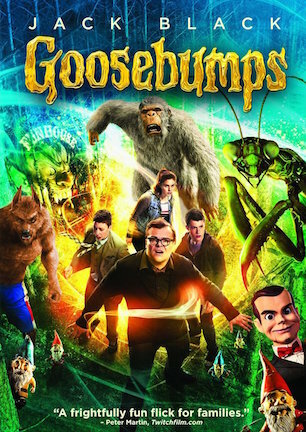 “Goosebumps” takes additional knocks from keeping a too full plate of undercooked comic relief. It’s a waste of talent to have Ken Marino occupying a collective one-minute of screen time in a role unrelated to the main arc. Deleted scenes probably exist where the secondary player slate has a beefed-up presence, yet in the final cut, they are so inconsequential it is surprising their characters bother having names. Scares come mostly from sudden crashes or bird wings flapping, which is fine for a PG rating. Though for a family-friendly film, there is a fair deal of frightening fun to be found in the nearly nonstop onslaught of freeze ray-firing aliens, fanged Venus flytraps, and levitating demon dogs. “Goosebumps” cooks its heroes with a surprising amount of fire, even a little bit of blood, and all of it is appropriately amplified by the melodic hyperactivity of a Danny Elfman score. A personal growth metaphor finds a way to put a little meaning behind the mania in the meanwhile. It’s a fitting one too, about not immersing one’s self too deeply in fantasy. It is hardly a misguided message to remind an increasingly second screen-dependent youth culture to stop for a rose sniff, though the need for a happier ending negates that sentiment somewhat with a last-minute switcheroo. “Goosebumps” manages to be cute without being cuddly, and broadly appealing without dulling every edge. The movie may boil down to a lot of colorful noise meant mainly for easy-to-eat entertainment, but the main selling point of the source material was not exactly narrative intricacy or multifaceted depth, either. January 14, 2016 by Ian Sedensky.